The purpose of the toolkit is to provide wards and departments with a coordinated, comprehensive, up to date range of standards, which can be self assessed, providing accurate, timely feedback. The toolkit is set out under the seven domains of Standards for Better Health, and each section has a detailed set of standards with prompts and a traffic light scoring system. The toolkit will not only help ward and department leaders assess their areas, but will also act as a point of reference for both existing and newly appointed ward and department leaders, who can often go into their post relatively unprepared for the challenges they face. Additionally, it will provide the Trust with an overview of the common issues to feedback through the Directorate and Trust governance arrangements. For pricing and information of the training sessions, please see the bottom of this page. Directorates (via their executive teams) will be responsible for embedding the reviews within all clinical areas. A lead for each clinical area should be nominated. It is the responsibility of the lead to coordinate the date and team for the assessment. Training for the Clinical Assurance Toolkit (CAT) lead in all clinical areas will be provided. The assessment team should be as multidisciplinary as possible. It is expected that as a minimum, the assessment team will consist of a Matron, ward manager and governance lead. Negotiate date of assessment to allow time for completion of as many specific activities highlighted within the toolkit, e.g. infection control accreditation programme. Ensure staff are aware of the review date for their ward/department and are available to take part in the assessment process. All wards/departments will have one assessment completed anually. The assessment may be repeated dependent on the outcomes of the last assessment. For all red scores and amber scores, an action plan is to be completed and consideration given as to whether more detailed audits are required e.g. infection control audit, environmental, documentation. A summary of the completed assessment and action plans will be formulated by the nominated lead for the day. The ward manager should feedback to staff regarding the action plans and outcome. The completed assessment tool should be available to staff. The Directorate Executive team will receive the completed assessment via the Governance Lead. If there are issues which score red in relation to clinical standards or health or safety, they must be discussed immediately with the Directorate Executive team, in order for appropriate action to be taken. Early re-audit, within 3 months will take place in those areas with red scores. In all other areas a planned re-audit will be scheduled for 12 months. The Directorate Executive team will collate all action plans and summary reports and present findings to the Central Governance team. Anyone wishing to order multiple copies of CAT may wish to consider purchase of a Trust wide licence to print and distribute their own copies for internal use at £350 + VAT. Terms and conditions of End User Licence Agreement will be available for download soon. For delivery to other countries, please contact ennovations@medipex.co.uk. For the CAT process to be really effective teams need to complete the Toolkit at least every 12 months. 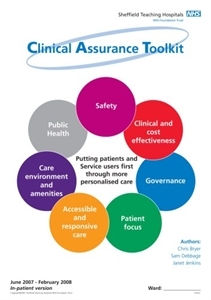 The Clinical Assessment Toolkit evolved over several years and involved extensive consultation, input from a development group and piloting in a number of departments before the Toolkit was considered valid. The authors were involved in delivering a number of training sessions in individual wards as a precursor to effective deployment of CAT. If anyone is considering use of CAT it is strongly recommended they adopt a similar approach. One training session and a follow up session after 6 months would be sufficient to train a number of leaders to instigate a rolling Trust wide take up. Typical costs for the authors to deliver a small training seminar would be: £350 + VAT half day plus out of pocket travel expenses. £700 + VAT full day plus out of pocket travel expenses.